What, you haven't seen Nosferatu yet? But you're in luck: not only do you still have a few days left to fit this seminal classic of vampiric cinema into your Halloween viewing rotation, but when the 31st comes, you can watch it free online yet again. An inspiration for countless vampire films that would follow over the next ninety years, F.W. Murnau's 1922 silent feature adapts Bram Stoker's Dracula, but just loosely enough so that it could put its own stamp on the myth and not actually have to pay for rights to the novel. Jonathan and Mina Harker? Now Thomas and Ellen Hutter. Jonathan's boss Renfield? Now a fellow named Knock. Count Dracula, to whose vast and crumbling estate Renfield sends the hapless Jonathan? Now Count Orlok — and unforgettably so. We can post no more relevant endorsement of Nosferatu's enduring value than to say that it remains scary, or at least eerie, to this day. I defy any sophisticated modern viewer to spend All Hallows' eve with this picture and not come away feeling faintly unsettled. Part of it has to do with sheer age: while some visual effects haven't held up — get a load of Orlok escaping his coffin in the ship's cargo hold, employing a technique trusted by every nine-year-old with a video camera — the deeply worn look and feel seems, at moments, to mark the film as coming from a distant past when aristocratic blood-sucking living corpses may as well have existed. This same process has, over four decades, imbued with a patina of menace every horror film made in the seventies. Fans of the 1979 Werner Herzog-Klaus Kinski collaboration Nosferatu the Vampyre, a companion piece obviously worth viewing in any case, can attest to this. You might also consider incorporating in your Halloween night viewing E. Elias Merhige's Shadow of the Vampire, a satire of the 1920s film industry's collision of eccentric old-world craftsmanship and savage commercial buffoonery which imagines Orlok as having been played by a geniune vampire. As for Francis Ford Coppola's rights-having 1992 adaptation Bram Stoker's Dracula... well, its chief point of interest is still Gary Oldman's hairstyle. 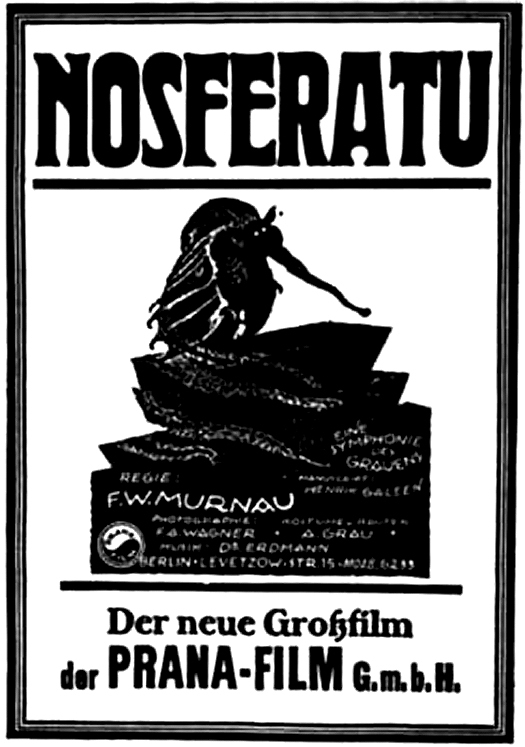 You can always find Nosferatu on our list of Great Silent Films, part of our larger collection, 1,150 Free Movies Online: Great Classics, Indies, Noir, Westerns, etc..
No sophisticated technology that leads to cruel reality.